Pushing innovation to elevate the gaming experience is something we constantly strive for. It was what drove us to create the first mechanical keyboard for gaming, then subsequently design our own Razer™ Mechanical Switches to meet the needs of different gamers. And with the new Razer Opto-Mechanical™ Switch, we’re redefining the standards of speed once again. 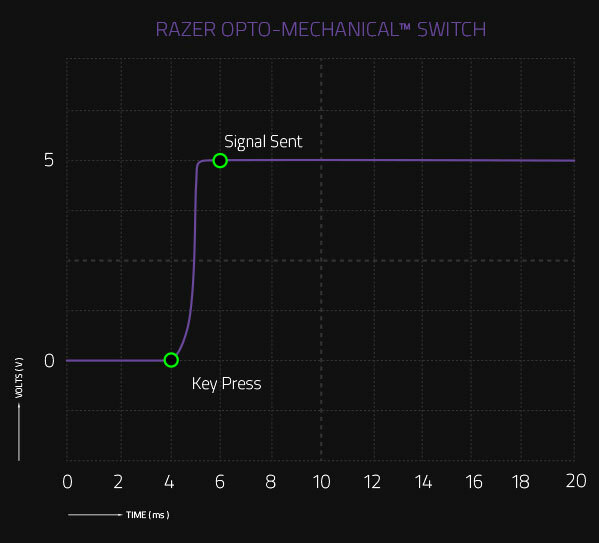 Unlike traditional mechanical switches that have a lot of moving parts and actuate via metallic contact, the Razer Opto-Mechanical™ Switch enables actuation via light. Imagine this: you press a key and a light beam instantly passes through the switch stem—which is when actuation happens—and sends a corresponding signal to your computer to perform the intended action. The same clicky, tactile bump. Opto refers to digital optical actuation, which works in parallel with the Mechanical click to provide the familiar clicky, tactile feedback of the Opto-Mechanical™ Switch. This unique hybrid allows the Opto-Mechanical™ Switch to provide the clicky bump reminiscent of the fan-favorite Razer™ Green Switch, but with a separate mechanism so your keypress is actuated the instant you feel the click. This was previously thought to be unattainable due to the physical implementation of mechanical switches, and sets a new standard for actuation at the speed of light. The Razer Opto-Mechanical™ Switch is found in our Razer Huntsman family and outfitted with the best components to make it our fastest clicky switch yet. A metal key stabilizer flanks both sides of the switch. 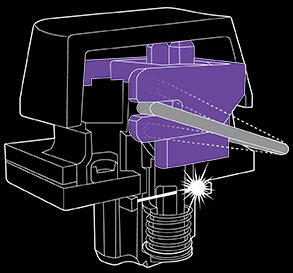 When combined with optical actuation technology, makes for fewer moving parts in the switch. Razer switches are known for their durability—and are now even better. With optical actuation providing less physical contact, Razer Opto-Mechanical™ Switches eliminate switch degradation almost completely. This provides durability of up to 100 million keystrokes, compared to the industry standard of 50 million. A new stem shape, when combined with the key stabilizer bar, allows for a more balanced keypress. Regardless of where you press on the keycap, you need the same exact 45 g of force for actuation—unlike traditional switches that can feel wobbly or misfire if you hit the edge of the key. The only clicky switch to actuate at a 1.5 mm actuation distance (30% shorter than other clicky mechanical switches). At only just 45 g of actuation force. Same actuation and reset point for instant reset. Get the performance of a linear switch without sacrificing tactility. 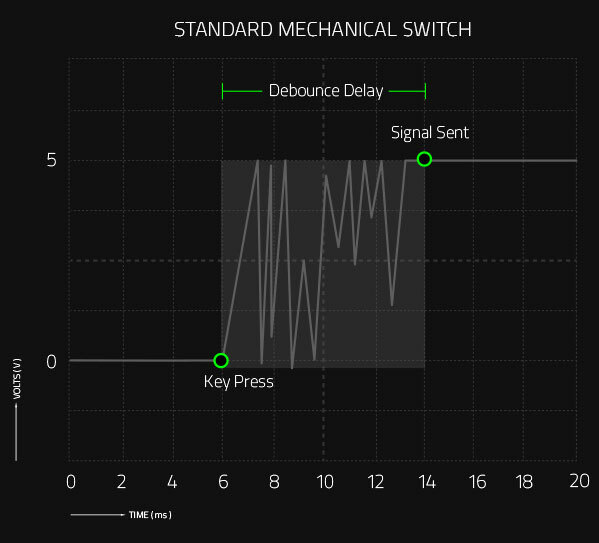 By using light to actuate, we eliminate bouncing found in traditional mechanical switches. As a result, the signal is sent the instant you actuate the key.